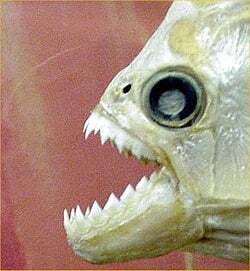 Is There A Piranha In Your Cubicle? Lawyer Diane Benussi has a warning for "salarymen" who unexpectedly hit it off with a female employee at holiday party: Beware the Office Piranha. According to stories in both the Telegraph and Daily Mail, Ms. Benussi deals with an increasing number of cases which involve single women chasing their baby-daddies for child support. She claims that many of these women are devious man-eaters. "A piranha will hang on for the kill and will rip any man to shreds," says Ms. Benussi. She explains that they look for a "high-earning, high-flying, high-virility man who will place a ring on their finger." Many of these women don't care if he's married or not, she says, and chances are this hookup may have already happened. Like, say, Christmas? Or New Year's Eve? "Office parties are a brilliant opportunity for [a piranha] to lead a colleague astray," she says. "The alcohol is flowing, they can wear sexier clothes and they just generally loosen up." Ms. Benussi swears that, in her experience, it's all premeditated. "There are women who join companies with large amounts of male employees with the sole intention of looking for a partner, and by that I mean an equity partner - one of the owners of the business. Christmas parties are notorious for people drinking to excess and flirting with the boss or senior manager they've secretly fancied all year. High-powered men who rarely get the chance to let their hair down may find themselves throwing caution to the wind.